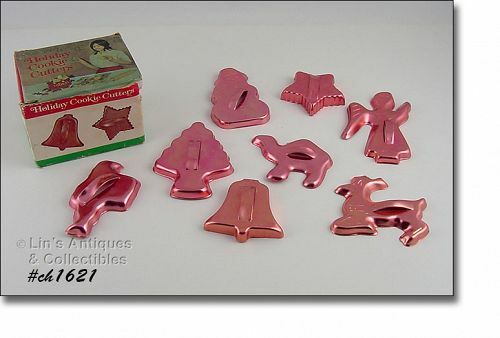 This listing has 8 copper color aluminum Christmas cookie cutters in the original box! Shapes are: reindeer, Santa, tree, angel, bell, star, camel, and a snowman. The cookie cutters appear new and unused – the reindeer has a tiny color rub (storage). The box has storage/age evidence. Box has “Made in the British Crown Colony of Hong Kong”.